Popular Filipino beauty blogger Michelle Dy suddenly brought up an old feud with YouTube vlogger Anna Cay on her Instagram stories on Wednesday. Similar to Dy, vlogger Anna Cay is also known for makeup tutorials, reviews and other visuals she shares on her channel. Dy shared screenshots of her private exchange with Cay back in 2016 as a way to clarify rumors being spread that time. The Instagram stories were quickly captured by online users. 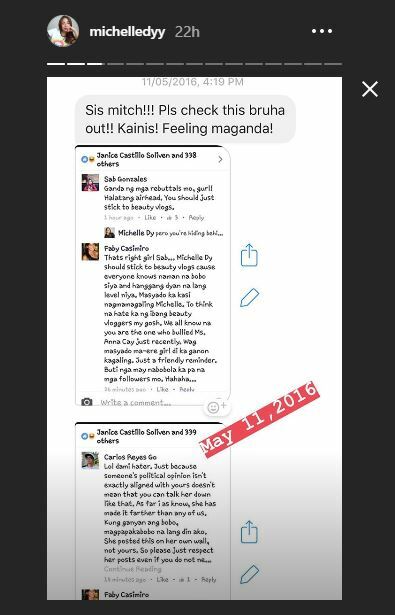 Dy also claimed to have received a picture stamped on May 11, 2016, wherein a part of the comments section from one of her social media posts was shown. Cay had seen the posts and questioned the YouTuber, while not mentioning Dy’s name, for sharing this supposed to be confidential information without her knowing. “Kung may pinagdadaanan kayong issue, I sincerely wish you well. But please naman, wag nyo akong gamiting pantakip sa issue nyo. Kasi kahit kelan, never kitang inattack in any way or pinagsabihan ng masama. Don’t use my screenshots Mamshie. That’s so 2016,” Caysaid. She also aired her grievances on how people kept “dragging” her name in Dy’s previous controversy with international makeup artist Jeffree Star. (1) Akala ko okay na lahat after nung convo pero bakit may mga parinig pa after? Akala ko ba wala kang issue sakin? Dinamay mo pa isang YouTuber na ka-collab mo. O screenshots lang kailangan mo? ? (2) Kahit ganon, may narinig ba kayo sakin? KAHIT ISA, WALA. Nananahimik ako hoping na tumigil kayo. Bakit hanggang ngayon kahit wala akong kinalaman sa issue nyo kay Jeffree Star, nada-drag pa rin ako? Sabi nyo viewers may kasalanan? May sari-sariling isip ang tao. Dy had recently earned the ire of Star who threatened to sue her over allegedly using his trademarked phrase on her channel. 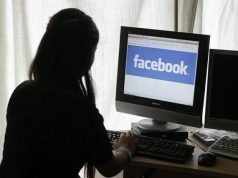 People speculated that the online controversy between these public figures came from a video Dy made with comedian vlogger Lloyd Cadena in 2016. They were then allegedly poking fun at Cay’s content, the recording has since been deleted. Another speculation also tells of Cay receiving negative messages from someone who claimed to be Dy via private chat. Cay did not respond on these issues back then, but she did claim there were harsh criticisms being thrown at her by other YouTubers, without naming any one, in a video in December 2016. Some people noticed that Dy’s post came a few days after Cay announced her upcoming makeup line and mobile app in her YouTube channel. The rising YouTuber revealed her two projects in her Singapore haul video last August 5. In an interview with Cosmopolitan Philippines, Cay said that her makeup line will only be a “small collection” for now. “Dedicated ‘to sa lahat ng makeup enthusiasts—kung nasaan ka mang point ng pagkahilig mo sa makeup. Because this is a line that aims to educate habang nagb–beautify,” she said.